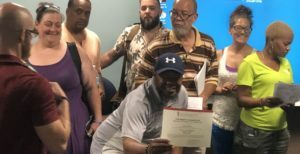 Learning to Represent at "Recovery is the Message" Training - Voices of Hope, Inc.
People in recovery and family members attended the Faces and Voices of Recovery Messaging Training on August 30, 2018 at the Susquehanna Workforce Center in Elkton, MD. Over 30 people were in attendance to learn how to carry the message that recovery works! Whether in private settings or with the media, the group practiced how to hone their recovery story into one voice with a message that we do recover. Presenters were Chelsea Duiett from Bowling Green Brandywine and Brandon Welsch, Director of the Office of Consumer Affairs at the Maryland Behavioral Health Administration. Sponsors were Voices of Hope and the University of Maryland Training Center. Training space was donated by the Susquehanna Workforce Center. Participants also earned 6 CEUs for the Certified Peer Recovery Specialist credential in Maryland. Thank you to all who attended, go carry the message!! !